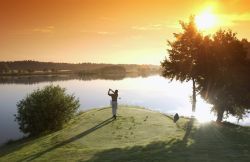 Golf in Poland - discover exciting Poland with us! Let us present to you our new offer of golf stay & play packages in Poland. From among still increasing number of golf courses in Poland we have chosen five of them with high standard of services and best available location. Golf become more and more popular sport in Poland and that's why our golf clubs are open also for new experiences and contacts with foreign golf players. Moreover your visit in Poland now may be properly filled not only with your hobby game but also with additional visit program in some of the worth to see cities and places in our country. Driving by golf car you can also visit Poland ! Look for other activities available in Poland here.